Recently, a research team led by Prof. WU Hong at National Astronomical Observatories of the Chinese Academy of Sciences (NAOC), and Dr. YANG Ming at National Observatory of Athens, Greece reported a spectroscopic redshift catalog based on the project of LAMOST Complete Spectroscopic Survey of Pointing Area (LaCoSSPAr) in the Southern Galactic Cap. Their study was published in The Astrophysical Journal Supplement Series. 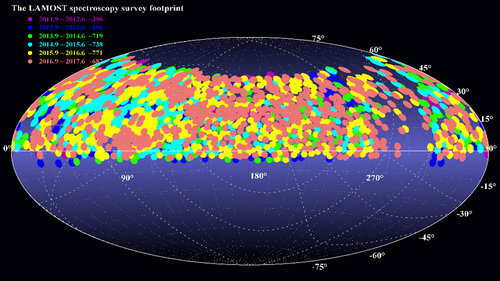 As an important part of the LAMOST scientific survey, LAMOST ExtraGAlactic Survey (LEGAS) aims to take hundreds of thousands of spectra for extragalactic objects over 8000 deg2 of the Northern Galactic Cap (NGC) as well as 3500 deg2 of the Southern Galactic Cap (SGC) in five years, and to study the galaxy evolution, AGNs/QSO, large-scale structure, dark matter/energy, etc. LaCoSSPAr, as part of LEGAS mainly focuses on the completeness of LEGAS in the SGC, the deficiencies of source selection methods, and the basic performance parameters of the LAMOST telescope. In addition to the main scientific goals, some other topics can also be addressed through the large FOV and numerous fibers of LAMOST, as well as the repeating observational strategy of LaCoSSPAr, such as the physical properties of galaxies, identification and kinematic analysis of galaxy clusters, spectroscopic time-series analysis of variable sources (AGNs and variable stars; Cao et al. 2016), identification and analysis of luminous infrared galaxies, and infrared excess stars (Lam et al. 2015; Wu et al. 2016). The project has considerable scientific value since it is the most complete data set in LEGAS up to now. LaCoSSPAr is designed to observe all sources (Galactic and extragalactic) by using a repeated observational strategy with a limiting magnitude of r = 18.1 mag (0.1 mag deeper than the LAMOST designed) in two 20 deg2 FOVs in the SGC. The observation has been conducted for about 14 months from September 2012 to January 2014. In both fields, more than 95% of galaxies have been observed. A post-processing has been applied to the LAMOST 1Dspectrum to remove the majority of remaining sky background residuals. In total, more than 3000 spectroscopic redshifts (absorption/emission line galaxies) have been identified by using visual inspection of combinations of different emission/absorption features with an uncertainty of σz/((1+z)<0.001) (Figure 1). Among the identified redshifts, 2/3 of them have never been observed before. The results show that it is possible to derive redshift from low S/N galaxies with the post-processing and visual inspection. Analysis also indicates that up to one-fourth of the input targets for a typical extragalactic spectroscopic survey might be unreliable. The improvement of the classification algorithm of the prior photometric survey could significantly improve the efficiency of the following spectroscopic survey. This may be important for the forthcoming large-scale spectroscopic surveys, like 4MOST, MOONS, WEAVE, DESI, PFS, MSE, and so on. The multi-wavelength data analysis shows that the majority of mid-infrared-detected absorption (91.3%) and emission line galaxies (93.3%) can be well separated by an empirical criterion of W2-W3=2.4. Meanwhile, a fainter sequence paralleled to the main population of galaxies has been witnessed both in Mr/W2-W3 and M*/W2-W3 diagrams, which could be the population of luminous dwarf galaxies but contaminated by the edge-on/highly inclined galaxies (~30%).